The Thundering Heard is a hard driving traditional bluegrass band from the Bay Area. 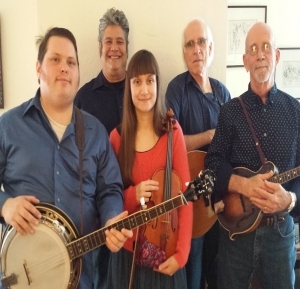 This band includes veteran players Butch Waller on Mandolin, Tom Diamant on Guitar, Victor Skidanenko on Banjo, Margaret Green on Fiddle, and Dave Gooding on Bass. The Thundering Heard plays both covers and original tunes with exceptional style and emotion. Don't miss the Heard rocking the Wheel!